Learn how to sort a transaction’s docs by their label. Open the transaction. Then scroll down to the document list. Click on the [Label] to sort the documents by their label. Click the icon again to sort in the reverse order. 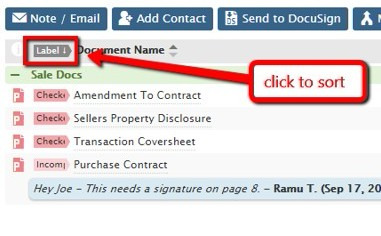 Documents without a label will not be be included in the sort and will remain at the bottom of the list of docs.